I mean, like, order them each an adult sized portion of fish for dinner because they’ll eat it all. I try to incorporate fish into the weekly menu at least once, hopefully twice. I like buying fish from a reputable fish counter/monger – I usually go to the fish guys at our local Fairway. I LOVE the idea of a FSA – have you heard about those? It’s like a CSA but for FISH! There is one on Brooklyn – Mermaid’s Garden – and one in Queens/Brooklyn – Village Fishmonger NYC. Because I have some restrictions – both in diet (Kosher) and time (business + children) – I find it hard to sign up for a CSA, so I rely on our local market for fresh fish. So I bought 2 skin-on fillets of nice looking Canadian Salmon for dinner. I usually do a marinade of honey-soy-lemon-etc – but as it’s Passover right now, I needed a soy-free, and grain-free option. 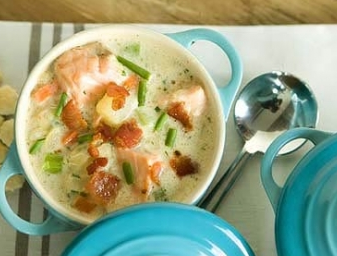 So WholeFoods has a super-duper easy Salmon Chowder recipe on hand. No flour, no corn-starch – PERFECT! You brown some onion and celery in a little fat (you’re supposed to use bacon, I used garlic confit with some liquid smoke mixed in). Then you add in some peeled and diced russet potato, ignore it for a few minutes while you deal with ominously quiet toddlers, then you dump in chopped up carrots and a bunch of broth. Bring to a boil, reduce heat to a simmer and walk away for like 10 minutes – in mommy terms that’s enough time to set the table, ask the kids to clean up their room AGAIN, and go potty. Once the veg is tender you dump in the milk, cream, 1″ cubes of salmon, some parsley, dill and some pepper. You let it simmer for about 5 minutes – until the fish is just done. If you’d like you can garnish the meal with crumbled bacon and minced chives. C and I BOTH had more helpings. It was really really delicious! Yeah, it needed salt and it was more soupy than chowder-y (which, by the way, was totally my fault. I added more broth in than I should have). Still, it was GREAT. So great that I just had had had to blog about it. 1/2 t Dried Dill (have you discovered Dorot yet? They make your life SO MUCH EASIER! They sell frozen herbs that are so freakin’ handy. I love love love them! I used their dill here. I used 1 cube which is actually about 1t. 1t fresh = about 1/2 t dried. It works out). 1 T Chives, minced **for garnish. 1- Brown bacon in a deep, heavy-bottomed sauce pot until crisp **I warmed up some Garlic Confit with about 1 t of Liquid Smoke to give the impression of bacon. Remove with a slotted spoon and set aside (if using, of course). 2- Cook onion and celery in the fat/oil until onion is translucent. 3- Add potatoes and cook about 5 minutes, stirring occasionally; do not brown. 4- Add carrots and broth and bring to a boil, then reduce heat and simmer until vegetable are tender, about 10 minutes. 5- Add milk, half-and-half, salmon, parsley, dill and pepper. Simmer over low heat 5-8 minutes or until fish is cooked through and liquid is steaming, but not boiling. 6- Transfer to serving bowls and garnish with crispy bacon and chives **if using, of course! And now I’m realizing I totally forgot to take a photo. 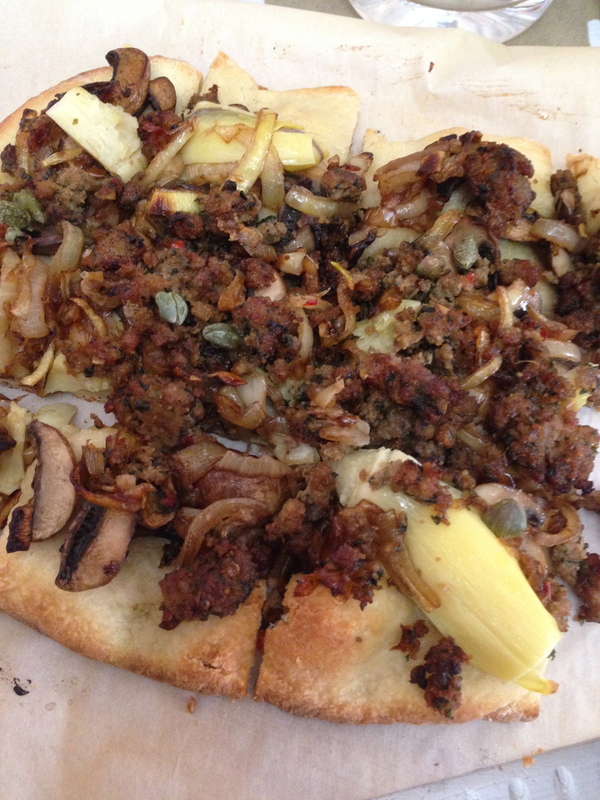 Tell you what, I’ll add in a photo of a non-dairy pizza I made last week (pre-Passover of course!) using Sweet Italian Sausage. That totally works, right? Kinda? I wanted pizza. Without cheese. I’ll ‘borrow’ the photo that came with the recipe. I ‘borrowed’ the photo that came with the recipe.